Cougar can supply Energy-saving high-pressure pump packages, designed for multiple gun wash down systems! Common multiple wash down systems are sized to run at full demand at all times with the unrequired water circulated until the demand is increased. The Wash-Saver system produces only the water flow that is actually required, eliminating the need to recirculate the flow. This results in significantly lower energy costs and water usage. 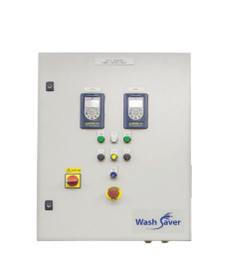 Demand is managed by the Wash-Saver control panel, specifically designed to exactly match demand with supply. 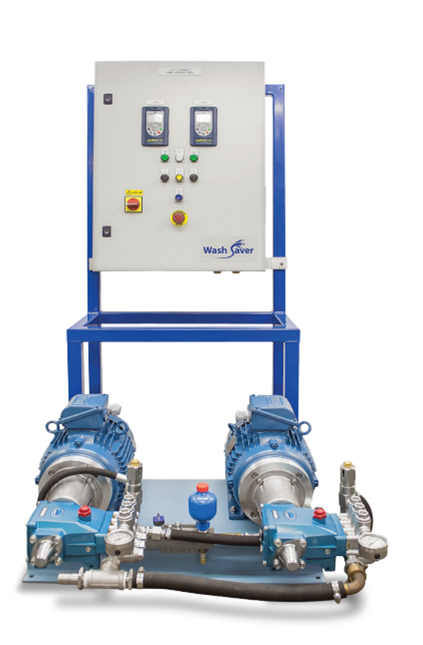 The Wash-Saver uses a feedback signal from a sensor to a variable speed drive (VSD) to control the pump speed. The pump, drive motor, accessories and VSD panel come fully assembled, tested and pre-configured at our UK facility to match customers’ individual requirements. Optional pre-piped water header tanks can also be supplied, and installation into existing centralised high-pressure pipe systems is an uncomplicated procedure. The control panel can be readily incorporated into a factory automation system or linked into local area network. Do you require a wash-saver system? Give us a call, or fill out our enquiry form, we’d be glad to quote. This entry was posted in Uncategorised and tagged Energy Efficiency, Pump Control, Pump Washer System, Reduced Costs, variable speed drive by shanay. Bookmark the permalink.